Meal planning - do you do it? Meal planning takes so much stress out of the week mostly because I shop once and I know what we are having every day. I'm not scrambling to think of things at the last minute and running to the store daily. I make healthier decisions. And finally, I save money because I plan around what is on sale that week and I reuse ingredients so nothing is wasted - like that big bag of peppers I get at the produce market is used on Monday for one dish and Thursday for another. When I'm planning I also think about what is going on every day and find that I often need quick and easy meals. Stir fried meats and veggies always make it on my list - so much prep can be done ahead of time and the cooking time is usually only as long as it takes the rice to cook (unless you use the Trader Joe's frozen brown rice - ready in just 3 minutes!). 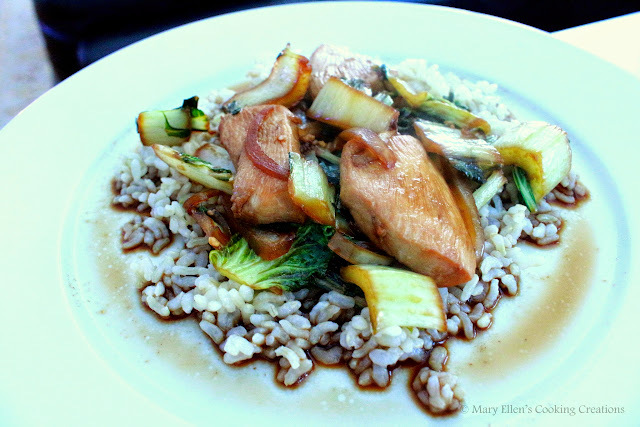 This Chicken and Bok Choy fits many of my requirements - healthy, full of flavor, well rounded, and of course, quick and easy. Heat a large, 12-inch skillet over high heat until extremely hot, about 5 minutes. Add 1 Tbsp vegetable oil and the chicken. Cook, stirring constantly, until meat is cooked through, about 3 minutes. Transfer to a plate. Add the bok choy and cook 1 minute. Stir in the onions, ginger, garlic and chili flakes; cook, tossing frequently until bok choy and onions are tender, about 1 minute. Stir in the marinade and chicken broth and let simmer 1 minute. 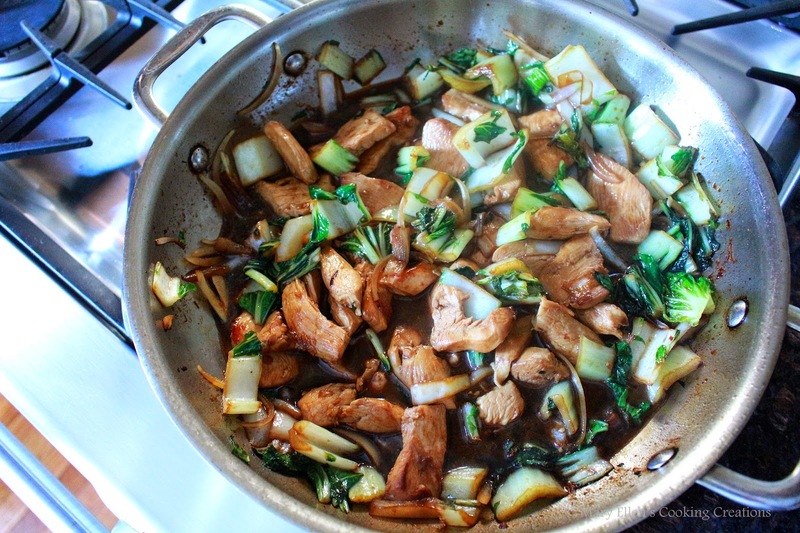 Return chicken to skillet and combine with ginger, garlic, and vegetables. Serve immediately, over rice. I DO meal plan - whenever possible.